Roana was a stray in Roanoke, VA, and ended up in the city shelter. She was in very poor condition. The shelter cleaned her up and the Blind Dog Rescue stepped in. Roana came to her BDRA foster home, just north of Roanoke, in January 2018. Roana is guessed to be at least 14 years old, and she weighs about 17 pounds. Sadly, she has many medical troubles. Most seriously, she has a large mass in one lung and a second, smaller mass in her other lung, along with a grade 5 (out of 6) heart murmur. In addition, she has cataracts along with entropion in both eyes; entropion is typically a very painful condition because the eyelashes are rubbing against the surface of the eye. The good news is the vet feels the eyelashes have been rubbing against her eyes for so long that it is no longer painful. Hopefully that is true! Roana has one, or maybe two, teeth, way in the back. There is so much tarter the vet can’t tell if there are one or two. Her tongue stays out almost all the time because she doesn’t have teeth to hold it in. She has numerous lumps and bumps of various sizes and colors all over her body. She often has trouble getting into a standing position, walking, and getting back down from standing. She is also underweight. She has not been spayed. 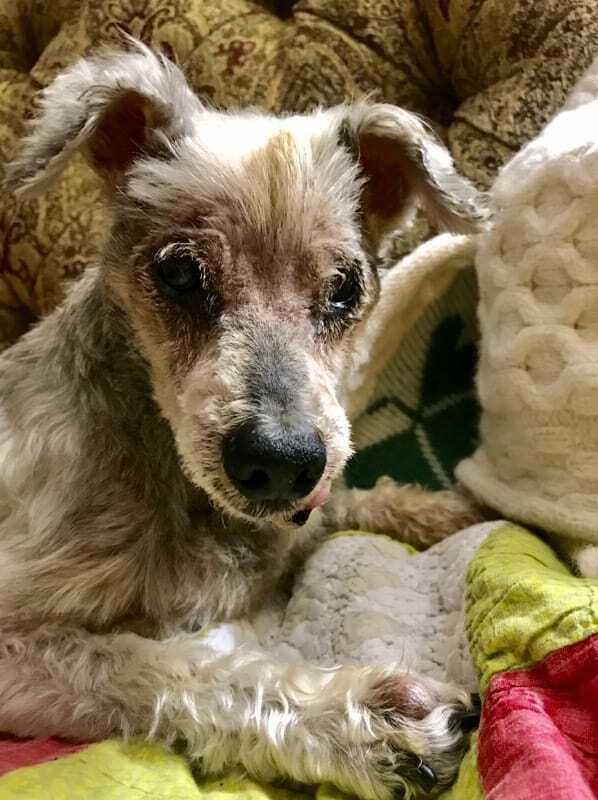 Due to the masses in her lungs and her heart murmur, she is not able to have surgery to correct the entropion, to remove her tooth or teeth, to remove any of the suspicious lumps, or to be spayed; she likely would not survive the anesthesia. She also has had an ear infection, eye infections, and a UTI which have been treated. 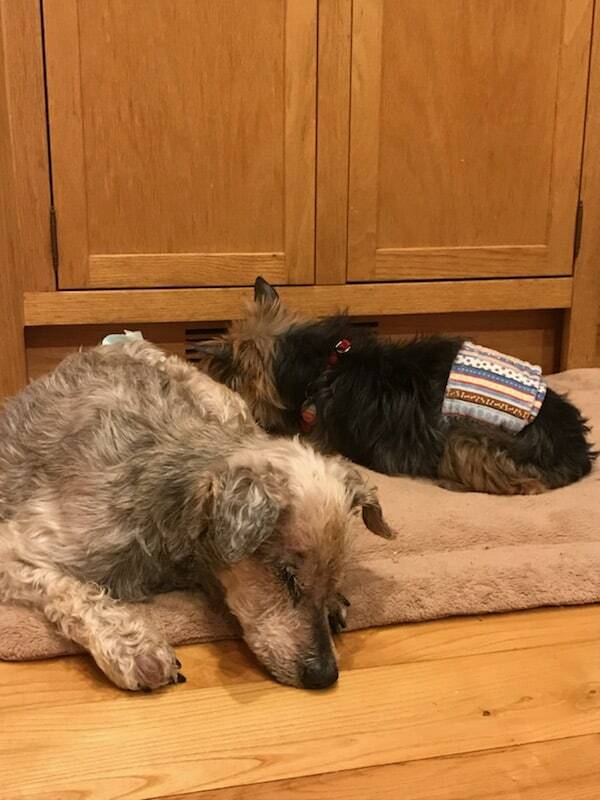 In spite of her medical issues, and in spite of being a homeless dog in the city of Roanoke, Roana (named after her hometown) is sweet and gentle, and is just starting to show her personality in her BDRA forever foster home. While she does sleep much of the day and night, when she is awake she likes to follow her foster parents around. She is also interested in the other four dogs in the home, but is respectful of them too. She will approach and sniff, but that is all. Every once in a while, she gets a spurt of energy and may slowly trot in the yard for a very short distance. And she has just started to give kisses! 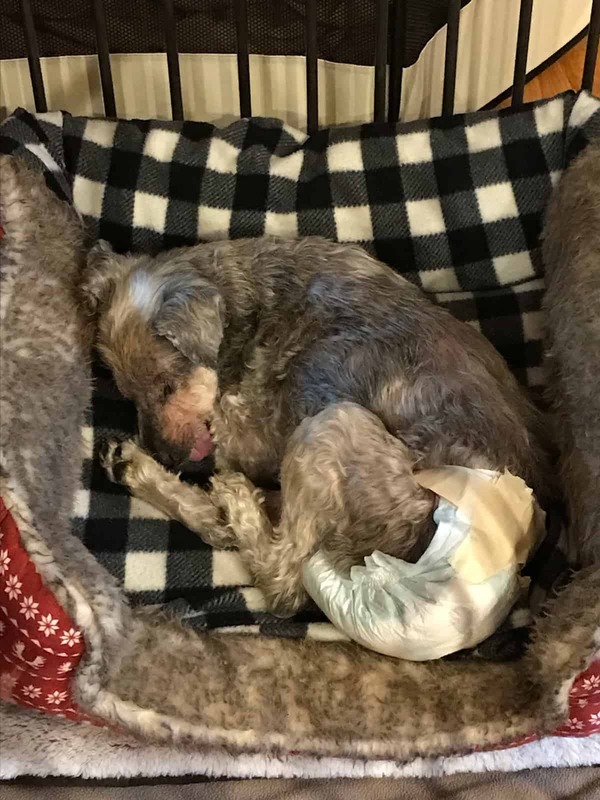 Roana is crate trained and housetrained, although may have a random accident sometimes, so she often wears a baby diaper. She walks fairly well on a leash. She loves to eat! She sleeps quietly all night. In fact, Roana is quiet all the time, and has not barked or growled or even whined. She has some limited vision but cannot hear. Because of her many medical issues, Roana is not going to be adopted, and, instead, is staying in her BDRA foster home. Her foster parents are very glad to have her for this last chapter of her life, and are doing their best to keep her comfortable and happy. Roana is forever in our hearts. Roana is looking for her forever home. If you think it could be yours, read more about Adopting from BDRA before submitting your application below. BDRA relies on your donations to rescue blind dogs around the United States. Please consider giving in support of Roana.